Launched in 1939, the reference 3525 can be considered as a milestone in Rolex’s rich history of chronographs as it was the brand’s very first chronograph wristwatch to be housed in an Oyster case, and equipped with a water resistant screw down caseback along with screw down crown. In production for less than 10 years, it was available in yellow gold, pink gold, stainless steel or in a combination of stainless steel and gold with a large variety of dials. A certain air of sotto voce luxury exudes from the present watch thanks to the case's perfect proportions and elegantly balanced silver dial design with multi scales. 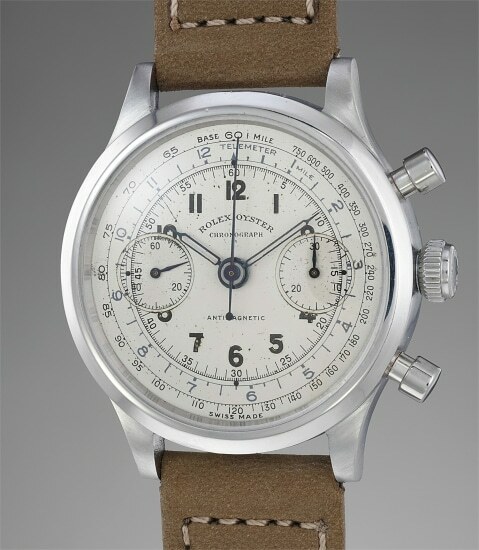 This particular watch is also very interesting as it is from the early generation of the reference. The serial and reference numbers are still stamped on the caseback while the later generation and future references will have them engraved between the lugs. In charismatic condition, the case is well preserved with the caseback full in its proportions with a crisp milled edge to the inner portion. The watch furthermore retains its original Oyster crown with Brevet logo.